I have always had extremely stubborn fat on my stomach. No matter how many sit ups or ab exercises I did, I could not get rid of that belly pooch. Now I will admit that while I do work out every day, I wouldn’t necessarily say I watch what I eat. I definitely eat in moderation and try to eat healthy but I’ve never been one to turn down a cookie or a slice of pizza. Up until a month ago, my only real option was to get liposuction if I wanted to really sculpt my stomach. 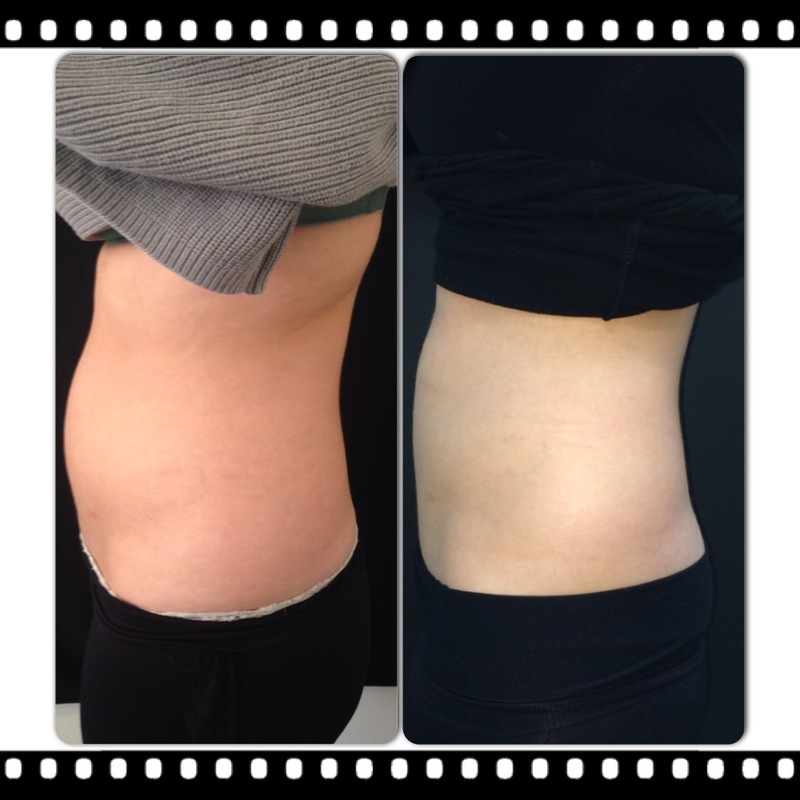 Then came CoolSculpting by Zeltiq. I had heard of CoolSculpting and had seen the results online and they looked phenomenal. Of course I wondered though would this really work on me? I was lucky to be the patient to receive treatment during training and wanted to share my experience before, during and post treatment. After getting all marked up for the two areas on each side on my love handles (4 areas total) I got prepped to have the machine put on. First they put a VERY cold gel pad on the first area to be treated. This pad is to prevent you, as the patient, from getting hurt at all if the machine malfunctions in anyway. It is sort of like a barrier. To be honest, this was the hardest part of the entire procedure, it is cold, like jumping into a cold pool after sitting in the jacuzzi. After that, they had me sit on the chair and positioned the applicator and turned the suction on. It is definitely a strange feeling but completely tolerable. I then laid down, positioned myself comfortably and they turned the cold on. The cold sensation is different and can feel a little uncomfortable but completely tolerable and after 5 minutes, I was completely numb. I spent the next 60 minutes talking on the phone, reading a magazine then watching an episode of a tv show. 60 minutes later they removed the machine, which hurts for a small second as they pull it off but then completely fine and the has the area massaged out. This was a tad uncomfortable but only for about 10 seconds. I flipped over and did the second side then, same routine. Immediately after the procedure I had some bruising but nothing bad. I got redressed and went back to work as if nothing had happened. Since I am a side sleeper I took some Tylenol before bed as my sides were tender but nothing some Tylenol or Advil couldn’t help. I did my lower abdomen a week later as well which was just as easy. I am about 5 weeks out and I can say the results are pretty astonishing already. The photos speak for themselves but I can honestly say I am shocked and so incredibly happy. 3 hours and no down time (I was back in the gym the next day after treatment both times), this procedure is a dream come true for those who do not have the time to take time off work or just have no wish to go under the knife. I cannot wait to see the results at 90 days! For more information on CoolSculpting and to see if you are a good candidate give us a call and schedule your consultation!